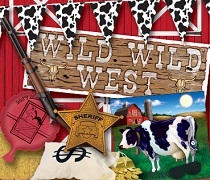 Head out to the Wild West, but before you do lasso some bulk cowboy hats, western decorations, and bandanas to have an authentic Texas style cowboy or cowgirl party! 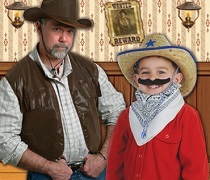 Turn any room into a scene from the Wild West complete with cowboys, bandits, and sheriffs. How do you make a one of a kind western party? The answer is simple, select bulk western party supplies from Party Express. Not only will you have fun doing it, but your event will look great too. You will find tons of western party ideas like bulk cowboy hats, sheriff's badges, you might even find a coonskin cap. Davy Crockett would be proud to see all of your party guests walking around in a cap that looked just like his! Let's not forget about the decorations. Hang up some wild west sign banners on the walls so there is no guessing what kind of party everyone just walked in to. You can put some campfire centerpieces on all of the tables. Let's be honest, who doesn't like sitting around a fire while the eat? Speaking of eating grab some bandana plates, cups and napkins to give your guest the real western experience. Maybe you prefer eating in barn. If you do we have everything you need to make any room look like the inside of a horse stall. Grab some barn door props and door covers, along with some cow print tableware and decorations. Now you are set to let your guests act like animals at this party, well behaved animals of course.